Fenugreek may sound like a foreign word but it’s a commonly found herb that literally means ‘Greek hay’. In desi terms, it’s nothing but methi. 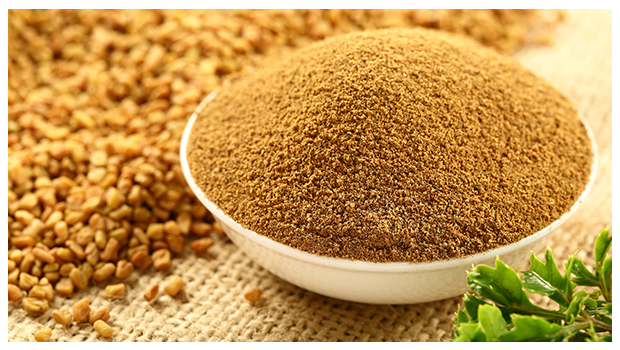 Fenugreek powder or powdered fenugreek seeds is used abundantly in Indian cooking. Not only does it add a unique, flavourful taste to the food, but also helps to keep our body healthy. Controls diabetes: Fenugreek has the properties that reduce the absorption of sugar by the body and on the other hand also promotes the secretion of insulin. Insulin is the hormone responsible for regulating the glucose in the blood. That is why, fenugreek is effective for both type 1 and type 2 patients. Consumption of 10 to 50 grams of fenugreek powder throughout the day is recommended. Just add half a teaspoon of fenugreek powder to every meal. Reduces pain during periods: If you experience pain every time you menstruate, try having fenugreek powder. 2 to 3 grams of fenugreek powder during the first three days of your period can help reduce the pain to a large extent. Curbs high cholesterol levels: Regular consumption of fenugreek powder through meals can also help cut down low-density lipoprotein (LDL or “bad”) cholesterol. Aids weight loss: A healthy stomach means better digestion, less bloating, removal of toxins and better weight control. A teaspoon of fenugreek powder mixed in a warm cup of water, can serve as an ideal decoction to curb constipation. Apart from being a natural digestive, fenugreek powder also helps to soothe the stomach and intestinal lining. This reduces acidity and heartburn. Fenugreek also stimulates metabolism and creates heat in the body which naturally helps you to burn fat a bit more while you workout. Enhance breast feeding: It has been found that if lactating mothers drink fenugreek infused tea, they are able to produce sufficient amount of breast milk – the best source of food and nutrients for a newborn. Keeps a tab on Hypertension: Being a rich source of potassium and sodium, consuming fenugreek powder on a daily basis can also reduce high blood pressure. Good for the heart: by keeping high BP and cholesterol in check fenugreek proves to aid heart health as well. Moreover, fenugreek also reduces the chances of atherosclerosis (narrowing and hardening of the arteries) which can otherwise lead to a heart attack. The above benefits of fenugreek powder only multiply when you consume its organic version. Organic fenugreek powder helps you get the benefits of the natural nutrients without the side effects of harmful chemicals. Get your organic fenugreek powder now from 24 Mantra Organic.